We’ve all heard before that “breakfast is the most important meal of the day!” But have you ever stopped to ask yourself why? What makes breakfast so important, and even more important than lunch or – my personal favorite – dinner? A small study of teenage boys was conducted in order to better understand the relationship between diet and obesity. The subjects were given breakfasts of equal caloric value , which had a low, medium, or high glycemic index. The boys were allowed to eat whatever they wanted for the rest of the day. The study found that on the days the boys ate 81% more the rest of the day after eating breakfasts with a high glycemic index. So if you are trying to watch your weight, trade in the coffee and pastry for a high protein or high fiber alternative. Do you find yourself feeling on track with your nutrition during the day, only to have uncontrollable cravings at night? A study out of the University of Missouri-Columbia found that participants saw less activity in the area of the brain responsible for controlling cravings during the evening on the days they ate a high protein breakfast. In other words, they had fewer cravings – and they also reported eating fewer high fat foods late at night. Next time you find yourself craving at night, add a little more protein to your breakfast the next day and see if those cravings disappear! When we don’t eat enough or go too long without eating our body responds by releasing stress hormones. One of those hormones is adrenaline, and it’s what makes you feel “angry” right before lunch or why things become more stressful late in the day. A change in your mood is sometimes a more reliable sign of hunger than a rumbling belly. So do your co-workers a favor and start your day right! What Are Some Quick and Healthy Breakfast Recipes? Although eating a balanced breakfast is important, it doesn’t have to be as extravagant as you may think. If you are in a hurry, start your day with a quick smoothie, or a hardboiled egg and some fruit. 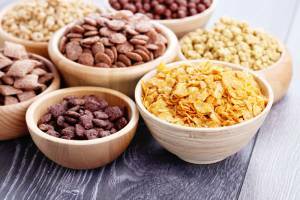 The most important thing is that there is a good source of protein and a good source of fiber. 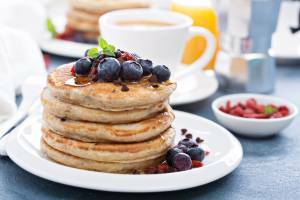 For some more quick and easy ideas check out these 5 Breakfasts in 5 minutes or Less! Tara Coleman is a Clinical Nutritionist with a private practice in San Diego, CA. She speaks nationally on the topics of health and nutrition and has been cited as a nutrition expert by media such as NBC, FOX, SELF, Cosmopolitan and Dr. Oz The Good Life.Download her FREE 4 Step Nutrition Quick Start Guide and start feeling better today!